While all hydroponic systems offer intriguing new ways to grow plants that our farming ancestors couldn’t have even dreamed about, NFT hydroponics is the only one that depends on a constantly flowing stream of liquid to feed plants, with their roots dangling down as if dipping their toes in a gentle mountain stream. Don’t let the technical-sounding name fool you into thinking it’s a difficult system to master. NFT hydroponics is simple to create and use, once you learn a few basic principles. So whether you’re just starting out with hydroponics, or you have some experience but want to try out something different, read on, and find out how you can produce fast-growing plants with a hassle-free nutrient film technique hydroponic system. 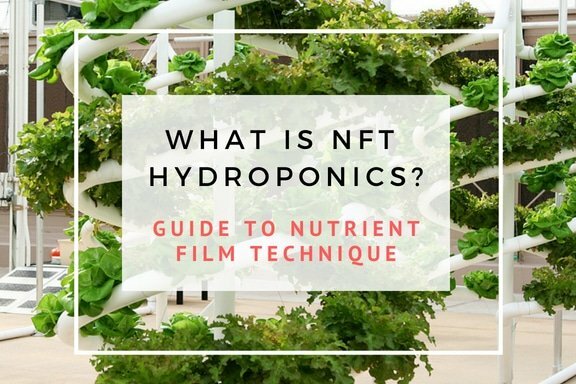 NFT hydroponics is a method of soil-less cultivation where plant roots are suspended above a stream of continuously flowing nutrient solution that provides them with all the water, nutrients, and oxygen they need to sustain rapid, healthy plant growth. The term “nutrient film” refers to the ideal situation of having a constant shallow stream of nutrient solution passing over the roots. This ensures that only the bottom part of the root mass will be submerged in the nutrient solution, while the upper part is left exposed to the humid environment created inside the growing chamber, thus providing the roots with an abundant supply of oxygen. Providing plenty of oxygen to plant roots is one of the key concepts behind hydroponics. While plants need carbon dioxide for photosynthesis, their roots need oxygen to facilitate the absorption of nutrients. And when their roots have greater access to oxygen, plants grow faster. How Does An NFT Hydroponics System Work? In nutrient film technique hydroponics, the chamber that the roots grow in takes the form of a tube-like channel that’s set at a slight incline so the nutrient solution will flow through it. These systems often consist of multiple growing channels because there’s a limit to how long a single channel can be for practical reasons and before nutrients start become depleted at the far end. The plants are situated in holes in the top of the growing channel, so the roots are suspended above the nutrient solution inside the chamber while the crown extends above. There’s often no need for a growing medium, with NFT hydroponics, other than net pots to support the plants. The solution is pumped from a reservoir to the higher end of the growing channel, and after flowing through the length of the channel, it’s returned to the reservoir. Nutrient film technique hydroponics is therefore a closed system that recycles the nutrient solution, allowing you to conserve water and nutrients. Why Choose Nutrient Film Technique Hydroponics? What Are The Disadvantages Of Nutrient Film Technique Hydroponics? One disadvantage of NFT hydroponics is its dependence on electricity, with the pump running 24/7. 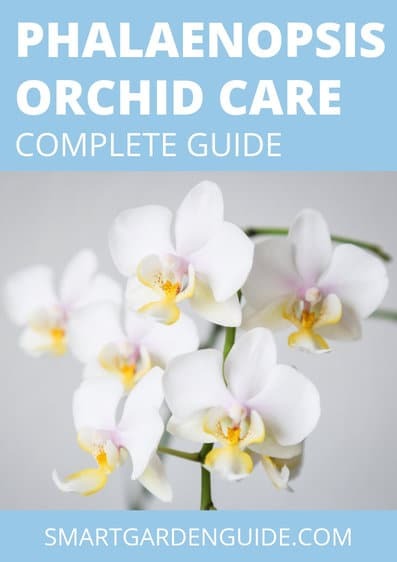 And if there’s a power outage or pump failure, the roots will quickly dry out and your plants could be severely damaged, even if it’s only a relatively short problem with the system. The other disadvantage is that larger plants, with more substantial root systems, and fruit-bearing plants pose significant challenges for nutrient film technique hydroponics. 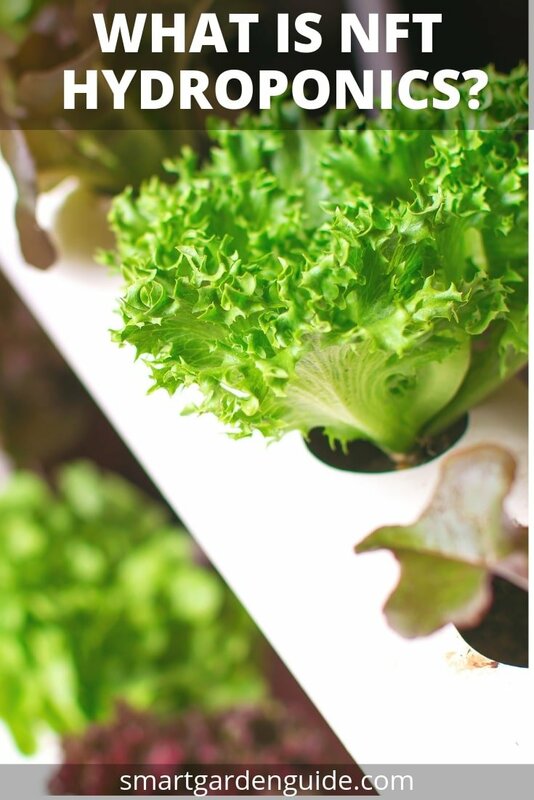 These systems are best suited for smaller, fast-growing plants such as lettuce, leafy greens, herbs, and a few other plants that will be harvested before the roots grow large enough to fill the growing channel and block the flow of nutrient solution. Fruiting plants are problematic for two reasons. First, they are heavy feeders, which will affect the pH and nutrient levels of the recirculating solution. Therefore, any time you have plants that are in their fruiting stage, you’ll need to be very vigilant about monitoring the solution to prevent deficiencies. Second, it’s been found that most fruiting and flowering plants do better when they are allowed to dry out between irrigation cycles, so the constant exposure to moisture that’s provided by NFT hydroponics isn’t the best environment for them. If you would like to read more about some of the other forms of hydroponics, or for an overview of hydroponics for beginners, please visit my hydroponics section. PVC pipes may serve as the growing chambers, although these are not ideal, since their curved contour doesn’t provide the optimal air-to-nutrient ratio for stimulating growth. The best materials for NFT system growing chambers are channels that are flat at the bottom. This way, you can create a nutrient film with a larger surface area for the roots to feed from while providing the upper part of the root mass with good exposure to the oxygen within the chamber. The growing chambers for this system have holes all along the top for the plants. And ideally, the tops will be removable so you can easily monitor the nutrient solution, check for pooling and blockages in the flow of the liquid, and inspect the health of the roots. However, removable covers aren’t a necessity for successful NFT system growing. As for the ideal length of the growing channels, they should measure no more than 35-40 feet (about 10-12 meters). Any longer, and you risk depriving plants located at the far ends of the channels from where the solution enters, since roots have been absorbing nutrients from the flow of solution all along the way. Shorter lengths will also make your system more versatile in terms of space usage, allowing for system designs such as a single loop made of a series of channels, a circuit with channels in parallel alignment, and vertical systems. There’s one other reason to go with shorter channels: they’re less likely to sag. When setting up your NFT hydroponic system, you need to take great care that your growing channels are correctly aligned to the desired slope and are well supported. It’s a good idea to check the integrity of your system before you begin growing plants by running plain water through it. And you should continue to watch out for sagging during use, as this will disrupt the flow of the nutrient solution. Usually referred to as net pots or net cups, these small baskets are used in hydroponic systems that don’t require any growing media as well as for starting plants. They hold the plants at the base of the stem and allow the exposed roots to grow and expand uninhibited within the growing chamber. With the exception of starting seeds or cuttings, the baskets in nutrient film technique hydroponics usually do not contain a growing medium, due to the danger of stem rot. If you are careful about matching the size of the baskets and the holes they fit into, it will be possible to transfer larger plants to larger growing channels or even to different hydroponic growing systems as they mature and their needs change. As with any hydroponic system, your nutrient solution reservoir should be made of an opaque material, to prevent the growth of algae and bacteria. If you locate your NFT system reservoir at the low point of the recirculating nutrient solution system, you won’t need an additional air pump or air stone to enrich the nutrient solution with oxygen. As the liquid cascades from the return line situated a little ways above the reservoir, this action will constantly aerate the solution. Also keep in mind that you will need to monitor the solution level in the reservoir as well as the pH and nutrient levels of the solution and make adjustments as needed. With nutrient film technique hydroponics, you need a reliable pump, as it will be continuously running to keep the solution flowing throughout the system. It doesn’t need to be a high-powered pump, since the aim is to create just a thin layer of liquid flowing through the growing channels. So you’ll want to choose a submersible pump with the lowest gallons-per-hour rating that has the capacity to pump solution from the reservoir up to the entrance of the first growing channel in the circuit, which will be the highest point in the system. From there, the solution will flow down through the circuit and eventually return to the reservoir, under the force of gravity. Another consideration in choosing a pump for your NFT system is that you may want one that has an adjustable flow rate that you can easily modify according to the changing needs of your plants as they grow. The amount of tubing you will need depends on the design of your system. A simple single-chamber NFT system will require, at the very least, enough tubing to deliver the solution from the reservoir to the high end of the growing channel, which could be set up to empty directly back into the reservoir. 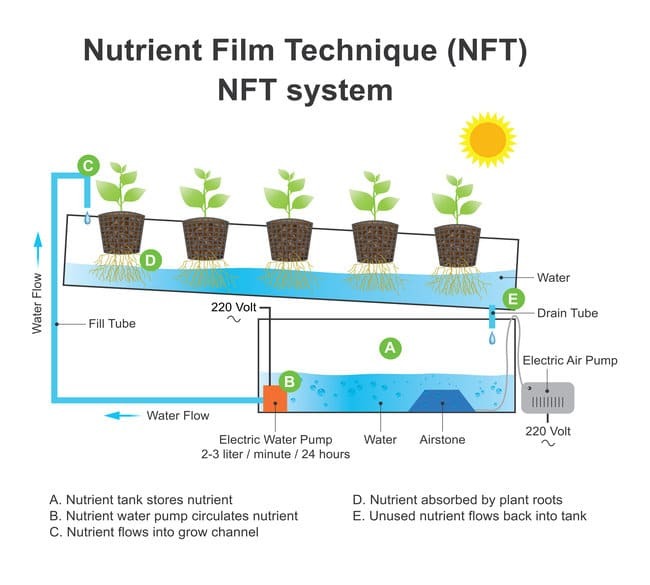 In an NFT hydroponic system, the growing channels are set at a slight tilt to create a rate of flow that results in a very shallow stream of nutrient solution. As a general rule, the flow rate in your channels should be around 1 liter per minute, which is about .26 gallons per minute or just shy of 16 gallons per hour. However, you can have a flow rate as low as .5 liters per minute or as high as 2 liters per minute without developing nutrient imbalances. To achieve this range of flow rates, the channel slope ratio should be between 1:30 and 1:40, meaning that for every 1 inch (or every 1 centimeter) difference in height, you have 30-40 inches/centimeters in length. This ability to modify the flow rate of your growing channels is particularly useful if you plan to start plants in your NFT system rather than starting them in a nursery and transplanting them after they have rooted. To start your seeds or cuttings, you will need to use a growing medium in your baskets to support the plants and ensure they receive the moisture and nutrients they need. Choose a medium that’s less likely to become waterlogged, such as oasis cubes, coco coir chips, or perlite. To encourage rooting, raise the volume of solution flowing through the growing channels while reducing the flow rate. That is, you want the level of solution in the channels to be a bit higher, but the speed of the flow to be lower. Just make sure you don’t raise the level too high, as you still need to have plenty of air in the growing chamber. If you raise the level, you should also increase the aeration of the liquid in the reservoir with an air pump and air stone to ensure you have the optimal amount of oxygen available to the newly forming roots. This method of rooting can actually speed up the production cycle of your crop. Are There Nutrient Film Technique Hydroponics Systems Available To Buy? 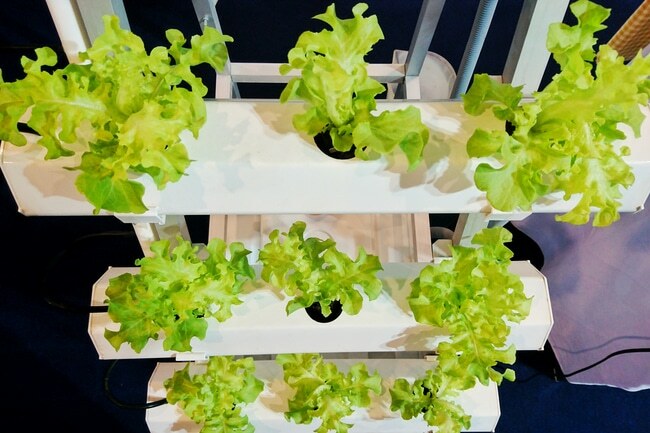 CropKing offers a variety of affordable NFT systems, including small introductory systems that are suitable for home hydroponics beginners and hobbyists, along with system components and growing supplies. HydroCycle Hobby NFT Lettuce Systems are another good place for anyone new to nutrient film technique hydroponics to begin. Although geared toward commercial growers, American Hydroponics offers several smaller versions of their sophisticated NFT systems for home growers and classroom settings as well as consulting services and custom designs.